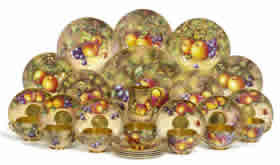 Royal Worcester Gallery – a brief look at examples of Worcester porcelain. 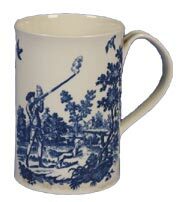 We’ve included the Royal Worcester Gallery to give you a brief look at a few examples of good quality Royal Worcester Porcelain. 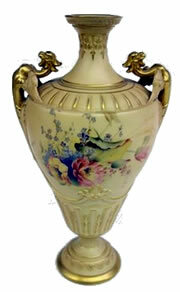 Quality porcelain from the oldest, continuously operating English porcelain factory still in production today. The Worcester Gallery includes items from renowned artists like Walter Sedgley, the Stintons, The Doughty sisters and many more. We will add to it as we can and when we discover more and more interesting items. 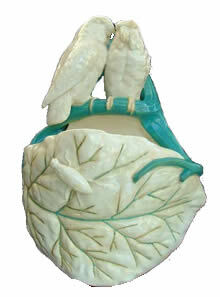 A Pair of Royal Worcester Porcelain Pedestal Vases and Covers, of neo-classical form, the scroll shoulder handles with mask terminals. Painted with pairs of pheasants perched in fruiting fir trees. Signed. The domed covers with painted bud finials. Bearing puce printed crown and wheel mark and year cypher. Shape 1911. Sold at auction for £2400 in 2007. 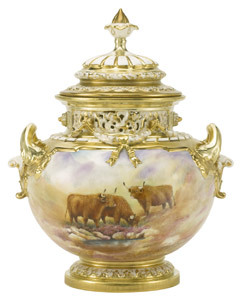 A Highland Cattle Painted Porcelain Pot Pourri Vase and Cover. 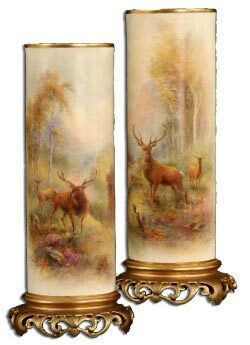 Of two-handled squat pedestal shape, the fluted and domed cover with bud finial, painted with a vignette of two longhorn cattle in a misty highland glen. The reverse with rocky vignette, with pierced collar and applied with swags, against a blush ivory/peach ground, enriched in gilt throughout. Signed and with Puce printed crown & wheel mark and date code for c1906. 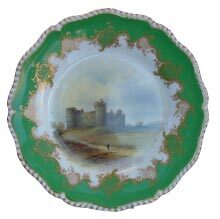 A beautiful royal worcester scallop edged cabinet plate showing a view of carew castle superbly painted by John Stinton c1933. With gilt feather edged dark green border overlaid with a leaf scrolled filigree band enclosing the central panel view. Bearing puce printed crown & wheel mark and year cypher, script mark and signature. Sold on ebay auction for £280 in 2006. Worcester workmans mark to the base. Sold at auction for £1200 in 2008. A small first period Worcester Polychrome bowl on a pedestal foot. Sold at auction for £140 in 2008. 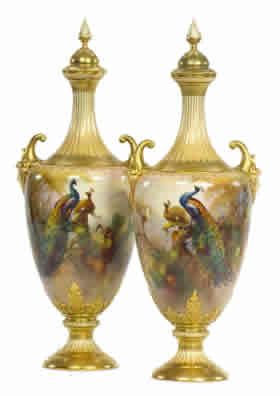 A pair of cylindrical Cabinet Vases with pierced gilt feet in the Oriental style. 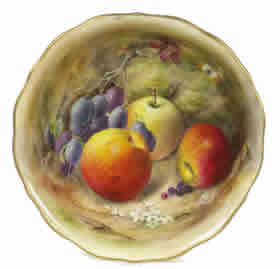 A Royal Worcester Fruit Painted Porcelain Bowl of waved circular form with everted rim. Decorated with three apples, damsons, blackberries and apple blossom, against a mossy bank with a moth. Gilt rim and misted gold exterior. Puce printed crown & wheel mark and year mark. 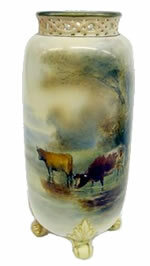 Sold at auction for £850 in 2007. A first period Worcester Blue and White Sauceboat decorated with the mission church scene pattern. Bearing Royal Worcester impressed marks and registration lozenge. Dating circa 1877. Sold on ebay for £250 in 2006. Signed by various artists including Freeman, V Cook, A Telford and D Bowen and comprising six teacups and saucers, eight small tea plates, three larger tea plates, a bread and butter plate, milk jug and sugar basin. Black printed crown and wheel marks. Sold at auction in 2007 for £4000. The shouldered ovoid body painted with a study of cattle below a blush tinted pierced collar and resting on four leaf scroll feet. Dated 1895. Shape 1674 with Puce Crown & wheel mark and date cypher for 1895. Sold at auction in 2008 for £105.